Phar Lap’s name comes from the Thai word for ‘lightning’ and is an apt description of this amazing horse. Although Phar Lap was born in Timaru, New Zealand in 1926, he’s still acknowledged as Australia’s most famous racehorse, decades after meeting his untimely demise. Ironically enough, Phar Lap started out as a quiet animal that became so fond of the then stable boy, Tommy Woodcock, that he wouldn’t eat unless Tommy was with him. Phar Lap was very docile and lazy back then. He came last in his first race and didn’t place in the next three. But Jack Baker, his 17 year old jockey, turned things around and his first race was won at Rosehill in 1929. Owners and punters got their first glimpse of what this remarkable horse was going to do and keep on doing. He didn’t race for a couple of months but the next time he came second at Randwick which earned him even more respect around the Australian circuit. 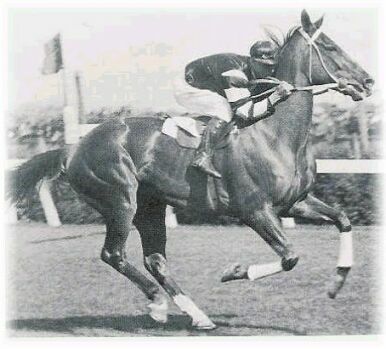 Phar Lap won the Melbourne Cup in 1930 and then won a further 14 races in a row. It was obvious to bookmakers, punters and owners that this horse was the one to back. He won 37 of the 51 races he competed in before meeting an untimely end in 1932. His death wasn’t proven but the suspicions were that a competitor had poisoned him because of his success. His success was so amazing that officials were forced to alter the weight-for-age scale so other horses stood a better chance of beating him but it didn’t help at all. He won nearly every major Australian race and won some of them twice. His single biggest achievement was in Agua Caliente, Mexico on the 20th March 1932. The actual win wasn’t the amazing achievement. It was the journey there that was incredible. He was taken by ship to San Francisco during their cold season. Then he travelled 800 kms by road to Tijuana to run this race. The weather there was unbelievably hot and felt moreso considering he had come from the icy cold San Francisco. He had to race on dirt for his first time. Phar Lap didn’t even place in his previous race in the Melbourne Cup four months earlier when he carried 68 kgs. He now had to carry 58.5 kgs and compete against the best American horses. Because he was in the Northern Hemisphere, his body clock was confused, getting ready for an Australian Winter instead of a stinking hot Mexican Summer. So he won this race against all odds in a remarkable feat of stamina and endurance. Phar Lap died in April 1932 from poison. Nobody can prove who did it and there have been copious tests done over the years. His heart has recently been moved to its new preservation place in Australia’s National Museum. His hide is also housed there. However, his skeleton is stored in New Zealand’s Dominion Museum. Many of Phar Lap’s records have never been broken and he’s a proud part of Australia’s Heritage.